Napa, Cal., Jan. 24. — In the presence of the sheriff and district attorney of Napa county, and of six other witnesses, George Willard Clark has confessed that he was the murderer of his brother, W.A. Clark, at St. Helena on last Thursday. Mrs. Levina Clark was married to William A. Clark more more [sic] than twenty years ago in Clay county, Illinois. She is 46 years old and the mother of seven children. George W. Clark, the murderer, became intimate with her thirteen or fourteen years ago. Their relations continued while the husband was in California making a home for her, and during that time a child was born of which George Clark was the father. After coming to California to live at and near St. Helena, Napa county, Mrs. Clark professed Christianity, and attempted to break off relations with her brother-in-law, but he persisted in his attentions. At times he asked her if she would live with him in case of her husband’s death. Last month he put strychnine in his brother’s coffee on two occasions, but the brother detected the poison and had the coffee analyzed by a druggist. Then, on Thursday morning George Clark lay in wait for his brother and shot him, while he was preparing breakfast in the kitchen of his St. Helena home. The murderer was brought to Napa. On Saturday Mrs. Clark told at the inquest the story of her relations with her brother-in-law, but George Clark continued to declare his innocence of t[h]e murder, until he was finally induced to make a full confess, the details of which do not differ materially from the facts of the crime already reported and confirmed by the statement of Mrs. Clark. 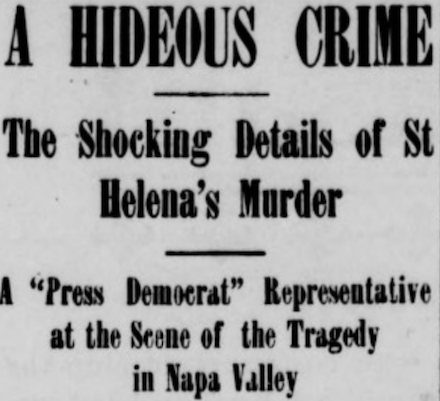 The pretty little city of St. Helena nestling in the picturesque Napa valley just a few miles from the Sonoma county line is now shocked and dismayed over one of the most hideous crimes, bristling with the darkest sense of horror, frightful in its details. The circumstances attending the cruel murder of William A. Clark in the gray dawn of last Thursday morning at St. Helena, as told by the murdered man’s wife at the inquest held Saturday, and on Sunday in the confession of the accused brother of the deceased, were such as to cause stout men’s hearts to quail and to paralyze the better feelings of the women of St. Helena who know Mrs. Clark, not, however, to respect her for many of them had known of her character long before the awful story of the crime. A PRESS DEMOCRAT reporter spent several hours at St. Helena Sunday and visited the scene of the tragedy. Everything around the town seemed gloomy. A pall seemed to have enveloped the vicinity of the little homestead where the cruel bullet fulfilled its ghastly mission and robbed W.A. Clark of his life. A glimpse was caught of Mrs. Clark’s face. To say the least of it, it was repulsive. The pictures of her which have appeared in the metropolitan dailies, if anything, flatter her. She is big, ungainly in figure, and not the least bit pretty. What surprises the people of St. Helena and everyone else who knows her, whether by sight or by description, is that any man, especially the brother of him who had taken her to be his wife, could have become infatuated with such a creature as to commit a foul murder in order to marry her, coupled with almost certain discovery of the crime, and the accompanying reward of capital punishment for the offense. Many people are ready to accuse the wretched woman of being a party to the crime. The trend of her dreadful story regarding her illicit relations with her dead husband’s brother, coupled with the repeated declarations of George Clark that she had many times promised to marry him if her husband should die, would seem to prove that she is morally, if not legally an accessory to the terrible crime. The circumstances of the killing are familiar to the readers of the PRESS DEMOCRAT. Last Thursday morning W.A. Clark was shot down at his home at St. Helena. George W. Colgan was the first person to bring the news to Santa Rosa, and the PRESS DEMOCRAT was the first paper north of San Francisco to publish the report. Soon after the crime the officers suspected George Clark of the murder. Why? Because it had been rumored in the community that it was George Clark who had on two occasions tried to poison his brother by putting strychnine in his coffee. The officers knew this. The officers went to George Clark’s house. They found him in bed. He was apparently asleep. He was awakened and told of the murder. He expressed great surprise and consternation at the news. The officers espied under the bed the suspects’ shoes. Those shoes were wet with fresh mud. A few minutes later those shoes corresponded with the prints in the mud at the murdered man’s house. Little by little the yoke was clasped upon the brother’s shoulders, and he is now awaiting trial in Napa county jail. San Quentin, Oct. 5. — George W. Clark, who is to be hanged at San Quentin Friday of next week, has made formal confession that he, and he alone, is responsible for the death of his brother. Clark, it will be remembered, is the man who was enamored of his brother’s wife, and with whom he had sustained forbidden relations. He imagined that if his brother were put out of the way the woman would marry him. Detection quickly followed the commission of the crime, and for a time Mrs. Clark was believed to be implicated. San Quentin state prison, Cal., October 4, A.D. 1898. — To whom it may concern: I, George W. Clark, incarcerate, believing that I am about to die, and sincerely desiring in these, my last days on earth, that the truth with reference to the specific crime with which I stand charged, shall be known, do hereby solemnly state that I, and I alone, am guilty of the same. That no one save myself alone was in any wise implicated in the same either before or after the fact, and the same was wholly plotted, planned, arranged and executed by myself with the knowledge or consent directly or indirectly of no one save myself only. I make this my last statement, more particularly to and to exhonerate [sic] one Mrs. Lavina Clark, then wife and present widow of William A. Clark, now deceased. I positively aver that she was not implicated therein in any shape or form, and so far as my knowledge goes had no knowledge or suspicion thereof. Witness: F.L. Abrogast, B.J. O’Neil. San Quentin, Oct. 21. 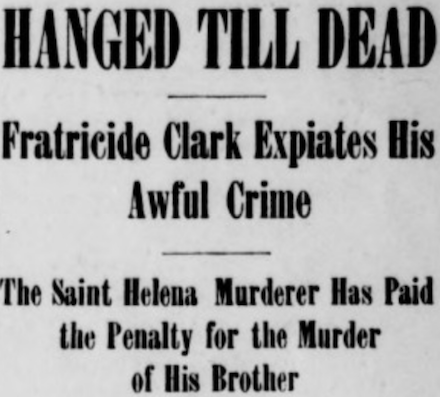 — George W. Clark of St. Helena, who murdered his brother because he loved the brother’s wife, was executed this morning at the penitentiary here. Coward though nature made the man, religion was able to transform him. Even Durrant was not more cool than Clark when he stepped on the death trap. The officers of the prison, knowing the mental and moral weakness of the fratricide, were prepared for what they most dread, a “scene” at the gallows. Until recently Clark shrank with most pitiable terror from the fate that the sentence had set upon him. Within the past few days, however, Chaplain Drahm the prison [sic] converted the condemned man and filled him with fortitude and resignation. Clark’s guards thought it was merely a temporary exultation of spirit that would depart when the prisoner stood on the brink of death. They erred. An hour before his execution Clark said to a press representative that he would die like a brave man. I am ready. The grave has no terrors for me; death has lost its sting. The Lord has been very good to me and I bear up bravely through this aid. My hope is in God. His strength and not my own supports me today. Beyond acknowledging my gratitude to God I have no statement to make. In the next life I shall receive my just due. I bear malice to no man, have no complaint to make, and will spend my last hour in pious exercises. The prison officials have been very kind. They could not have done more for me than they have done. Then Clark began to pray with Chaplain Drahm. With hymns and prayer they passed the speeding minutes until at 10:25 o’clock Warden Hale interrupted the devotions. The fratricide waived the reading of the death warrant. Guards fastened straps to his wrists and ankles and the little procession formed and [ … ] to the slate-colored gallows in the next room. Clark climbed the thirteen steps of the scaffold with firm tread. Of the fifty spectators a number were from Napa county. From the death trap Clark recognized a number of acquaintances to whom he nodded and smiled, as though he were passing them on the street. Quickly the knot was adjusted behind his ear, the black cap was drawn over his face, Amos Lunt, the hangman, lifted his hand as a signal, three concealed men cut three ropes, one of which released the trap, and the body of the fratricide dropped and hung quite still. Prison Surgeon Lawler, assisted by Dr. Mish of San Francisco and Dr. Jones of San Rafael, felt for the pulses and for respiratory movements. It was 10:32 o’clock when the body dropped. Ten minutes later the pulses ceased to beat and the lungs to expand. The corpse was cut down and laid in a coffin. Mindful of the ghastly incident of last Friday, when the rope nearly pulled Miller’s head from the trunk, Warden Hale was cautious that Clark should not be cut. The rope was given only five feet of slack, and after the execution the head of the corpse swung in the very aperture left by the opened trap door. It was a nice calculation, well made. The stiff, new hemp caused a slight abrasion from which blood trickled, but the flesh was not torn. Clark murdered his brother that he might be free to marry his brother’s widow. He had been unlawfully intimate with the woman during thirteen years. Very early one morning Clark went to his brother’s hom and found the man whom he was about to murder lighting the kitchen fire. Clark crept to a window and shot his brother from the rear. The victim died instantly. Clark was arrested on suspicion, and in the county jail at Napa broke down and confessed. He was convicted on March 23 of murder in the first degree. He was the twenty-first man hanged at San Quentin penitentiary.